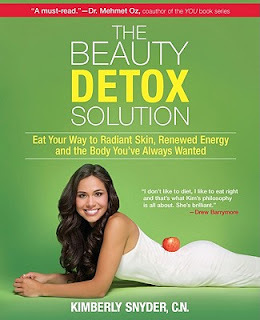 Kimberly Snyder’s first book, The Beauty Detox Solution: Eat Your Way to Radiant Skin, Renewed Energy and the Body You’ve Always Wanted has a no-nonsense approach, easily tailored to any lifestyle, where she explains how anyone can follow her three-phase program to look better than they ever thought possible! By following Kimberly's natural approach to health and beauty, you too can reap the benefits of cleansing their system: weight loss, glowing, radiant skin, lustrous hair, and better overall health. Kimberly's a favorite among many A-list celebrity clients and has successfully helped them obtain their optimal health and beauty. Now she's sharing the secrets of her revolutionary, simple plan for cleansing your body of unhealthy, age-inducing toxins for a younger, healthier, and more beautiful you. Click here to get your copy. You can learn more about Kimberly and get free information and sign up for her newsletter at her website: http://www.kimberlysnyder.net/. You can also follow her on Twitter and Facebook. Thanks for reading and the great tips! Happy Holidays!